Throughout the year I'll be bringing you some interviews with the authors over at the Class of 2K12! I hope you will enjoy getting to know these authors and thoughts on their books better. I'm so excited to kick off this series with Caroline Starr Rose who has been a long time commenter here. How has your personal history influenced the writing of your book? I grew up reading The Little House books and talked about Laura Ingalls like she was someone I knew personally. Her books were my first exposure to the American frontier, a time and place that has fascinated me ever since. I think part of the draw is the knowledge I would have made a wimpy pioneer woman. The courage, fortitude, and plain hard work these women needed just to live a regular life -- who’s built like this anymore? Before I started May B., all I knew was I wanted to write about a pioneer girl and trusted that as I researched a story would surface. It did. My teaching background also played into the storyline. I’ve always wondered how children with learning disabilities would have coped in an era before their struggles were identified and understood. May’s dyslexic but at the same time loves to learn and wants desperately to be a teacher. In 1870s Kansas, Her disability marks her as flawed. Even her family finds her expendable, she feels, when she’s pulled from school and made to work for the Oblinger family. Writing her story, I couldn’t help but think of the students I’ve had over the years, especially the ones I might have done better by. It’s a tremendous responsibility, teaching a child, and I’m haunted by some whose needs I didn’t fully understand or meet. In a large part, this book is for those kids, for any kid who’s been marginalized or feels she doesn’t measure up. If you had to describe your book in one word, what would it be? How did you react when you saw your cover? You have to understand that I had another cover to begin with, one that was very Laura-like and that I loved. When Random House closed my first imprint, Tricycle Press, I lost my editor, my cover, and even for a time the certainty my book would be published. Thankfully another Random House imprint, Schwartz and Wade, swooped in and picked up May a month later. My new editor had other ideas for my cover. She wanted something unique and eye catching, but something that also sent a message to teachers and librarians (because let’s be honest, they’re a huge part of my audience) about the type of book inside. This was hugely flattering because my art director chose to work with C. S. Neil, who created the covers for Laurie Halse Anderson’s Chains and Forge. I’m no Laurie, but to have my cover echo her historicals and even hint at some sort of similarity is both amazing and terrifying. I love being able to validate children through story, their experiences, fears, and dreams. Books are a place we get to examine life intentionally, its big events and small. Writing for children allows me to share the profundity of the ordinary, small moments that make up our lives. Middle grade books are really the first children explore on their own. As independent readers, kids start to develop their interests and preferences in literature while growing into their own personhood. I know Young Adult fiction is often described as the genre for firsts: first love, first big decisions, etc. But to me, mid-grade is the ultimate genre for the first experiences and emotions that are all a part of growing up. I’m in the middle of two books right now, If On a Winter’s Night a Traveler and The Night Children. Before that it was The Dark and Hallow Places. The fact that it ended up in verse. I’d only read two verse novels prior to writing May, and I wouldn’t let myself anywhere near one while working on the first draft (I figured what I’d created would fail so miserably in comparison, I’d get discouraged and never finish). I initially tried a few scenes in prose, but everything felt too far away from the character and her circumstances. When I went back over the first-hand accounts of pioneer women, I was struck by the spare, matter of fact tone of their letters and journals. That’s when I turned to verse. I wasn’t really sure what I was doing, but I could tell what I was writing felt like the most honest way to write May’s story. 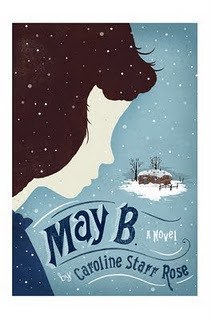 May B is available January 10th from Schwartz and Wade (Random House Children's Books). About the book: Abandoned in a one-room soddy, May Betterly must withstand a blizzard and face her own shortcomings in a solitary struggle to survive. I watch the wagon until I see nothing on the open plain. For the first time ever, I am alone. May is helping out on a neighbor’s homestead—just until Christmas, her pa promises . But when a terrible turn of events leaves her all alone, she must try to find food and fuel—and courage—to make it through the approaching winter. This gorgeous novel in verse by Caroline Starr Rose will transport you to the Kansas prairie—to the endless grassland, and to the suffocating closeness of the sod house where May is stranded. May’s eloquent, straightforward voice, and her bravery, determination, and willingness to risk it all will capture your heart. Learn more about Caroline by visiting her at her website!